NEW DELHI, India, January 21, 2015 (ENS) – India’s wild tiger population has risen to 2,226 animals, an increase of 30.5 percent since the last estimate four years ago, according to a new report published today by the government of India. The report, “Status of Tigers in India, 2014,” issued by the National Tiger Conservation Authority, is welcome good news about tiger recovery after decades of poaching and habitat destruction. It shows that the future of tigers in India depends on maintaining undisturbed core habitats for breeding tiger populations, habitat connectivity and protection from poaching of tigers and their prey. 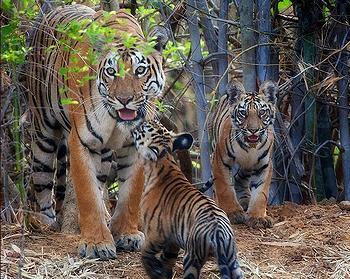 “At a time when the global tiger population is under threat, it is heartening that India’s tiger numbers are increasing. This was not the situation a decade ago and I am proud that we have risen to the challenge and turned the situation around,” said Prakash Javadekar, minister for environment, forests and climate change at an event marking the release of the figures. The event brings together the chief wildlife wardens of tiger states and the field directors of tiger reserves for two days of collaboration. In 2006 the government estimated there were just 1,411 wild tigers in India, a little less than half of all the world’s tigers remaining in the wild. By the 2010 estimate, India’s tiger population had increased to 1,706 animals. Minister Javadekar said that government initiatives to streamline tiger conservation along with effective forest management and community participation had led to the increasing tiger population. He attributes the rising tiger population to the success of various government measures – the Special Tiger Protection Force, Special Programme for Orphan Tiger cubs, efforts to control poaching and initiatives to minimize human-animal conflict and encroachment. India is willing to donate tiger cubs to the international community and play a key role in global tiger conservation efforts, the minister said. The new tiger population estimate is based on a survey of 378,118 square kilometers of forest area in 18 Indian states known to be inhabited by tigers. Investigators captured a total of 1,540 unique tiger photos. The survey shows that tiger populations have increased in the states of Karnataka, Uttarakhand, Madhya Pradesh, Tamil Nadu, and Kerala. The accompanying assessment of the change in forest cover in the tiger landscape of the Shivalik-Gangetic Plain indicates an improvement of forest cover in core areas of tiger reserves. Poaching remains the greatest threat to wild tigers today with tiger parts in high demand throughout Asia. Since 2010, all tiger range countries have been working to double global tiger numbers from an estimated 3,200 animals, a goal known as Tx2. TX2 is a 12-year global goal, from the last Year of the Tiger on the Chinese calendar in 2010 to the next in the year 2022. An essential part of Tx2 is for countries to count their tigers. 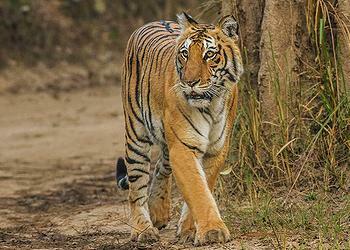 India’s 2014 tiger estimation is the largest and most thorough tiger census ever undertaken. This encouraging tiger population estimate from India, coupled with the increase from the last census, demonstrates that even in densely populated and economically booming Asia, ambitious targets for species recovery can be achieved, said WWF in a statement today. WWF was a driving force behind the Tiger Summit in 2010 and remains a major force behind TX2 by driving political momentum to ensure tigers remain a top priority for world leaders, professionalizing wildlife protection by training rangers, as well as developing conservation standards and technology to achieve zero poaching. At a conference in Dhaka, Bangladesh in September 2014, tiger countries agreed to release a new global tiger population figure in 2016, the halfway point to Tx2. This year Russia will carry out a full range Amur tiger survey, with surveys also expected from Bangladesh, China, Nepal and Bhutan. Comprehensive surveys are urgently required in Malaysia, Indonesia, Thailand, Myanmar, Laos, Cambodia, and Vietnam, WWF urges. WWF is also tackling the illegal wildlife trade through a partnership with the UK-based international wildlife monitoring organization TRAFFIC. TRAFFIC released a report in December showing that the trade in tigers and other wild cat parts from Myanmar into China has grown in recent years while the same trade into Thailand has diminished. Traders in two border towns told TRAFFIC investigators that the illegal tiger products were mainly sourced from Myanmar and India. Upcoming in February, one of the most significant anti-poaching meetings ever held, Symposium: Towards Zero Poaching: Asia, will be hosted by the government of Nepal. This event will be attended by at least 13 Asian governments, with the objective to launch an immediate, coordinated region-wide effort to halt poaching across Asia.